Hope everyone is enjoying their new year. Well I started 2010 off right. Like I said in my other post I missed my NYE Party rrrrg! So I was all excited about my cruise I had paid for earlier in the year. 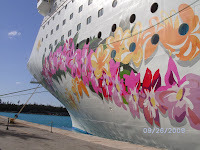 We sailed from Miami (oh how I luv thee) to Freeport, to Nassau Bahamas to the cruise lines private island. I had soooo much fun. We got to the room and I must say wow. If I were any bigger than I am I wouldn’t have gotten in the room . . . . . . seriously. The bathroom all you can do is turn around, very compact but clean! Until my Moms spilled water on the carpet and as another cruiser we met put it "let the spirits out" LOL. The smell was awful; we thought the toilet had over run. I guess that’s what you get for getting the cheaper room. The food was wonderful, staff great, cruise director (Matt Baker from Wales U.K.) hilarious! And DJ Impulse from Philly was super nice my Mom and I had fun chatting with him, he was kinda cute if I must say . . . . yea I must. You can find him on the web buy a few tracks have fun. 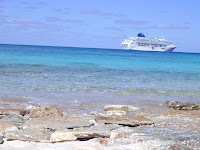 I had such a relaxing time I'm looking for another cruise real soon. Now we did go to the beach and there was a pool and Jacuzzi, but this big girl don’t do that. 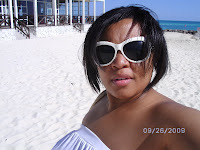 I guess I have to mature in my bigness a bit more to put on a bathing suit but I don’t do bathing suits. I have a swim dress . . . . yea I said it, a swim dress which is really cute by the way. I do plan on finding an appropriate swim suit for me that will be cute and flattering. Any suggestions?? I want every last piece!